This family includes NurA a nuclease exhibiting both single-stranded endonuclease activity and 5'-3' exonuclease activity on single-stranded and double-stranded DNA from the hyperthermophilic archaeon Sulfolobus acidocaldarius (PUBMED:12052775). 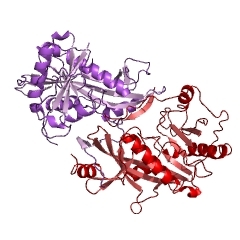 This domain is found in several uncharacterised proteins and in NurA, a nuclease exhibiting both single-stranded endonuclease activity and 5'-3' exonuclease activity on single-stranded and double-stranded DNA from the hyperthermophilic archaeon Sulfolobus acidocaldarius [(PUBMED:12052775)]. There are 1743 NurA domains in 1743 proteins in SMART's nrdb database. Taxonomic distribution of proteins containing NurA domain. This tree includes only several representative species. The complete taxonomic breakdown of all proteins with NurA domain is also avaliable. Click on the protein counts, or double click on taxonomic names to display all proteins containing NurA domain in the selected taxonomic class. Comparative genomics of the FtsK-HerA superfamily of pumping ATPases:implications for the origins of chromosome segregation, cell division andviral capsid packaging. 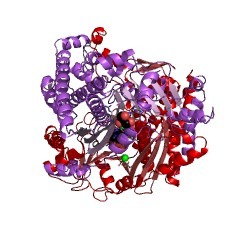 Recently, it has been shown that a predicted P-loop ATPase (the HerA orMlaA protein), which is highly conserved in archaea and also present inmany bacteria but absent in eukaryotes, has a bidirectional helicaseactivity and forms hexameric rings similar to those described for the TrwBATPase. In this study, the FtsK-HerA superfamily of P-loop ATPases, inwhich the HerA clade comprises one of the major branches, is analyzed indetail. We show that, in addition to the FtsK and HerA clades, thissuperfamily includes several families of characterized or predictedATPases which are predominantly involved in extrusion of DNA and peptidesthrough membrane pores. The DNA-packaging ATPases of variousbacteriophages and eukaryotic double-stranded DNA viruses also belong tothe FtsK-HerA superfamily. 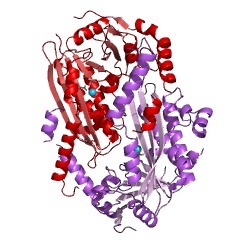 The FtsK protein is the essential bacterialATPase that is responsible for the correct segregation of daughterchromosomes during cell division. The structural and evolutionaryrelationship between HerA and FtsK and the nearly perfect complementarityof their phyletic distributions suggest that HerA similarly mediates DNApumping into the progeny cells during archaeal cell division. It appearslikely that the HerA and FtsK families diverged concomitantly with thearchaeal-bacterial division and that the last universal common ancestor ofmodern life forms had an ancestral DNA-pumping ATPase that gave rise tothese families. Furthermore, the relationship of these cellular proteinswith the packaging ATPases of diverse DNA viruses suggests that a commonDNA pumping mechanism might be operational in both cellular and viralgenome segregation. The herA gene forms a highly conserved operon with thegene for the NurA nuclease and, in many archaea, also with the orthologsof eukaryotic double-strand break repair proteins MRE11 and Rad50. 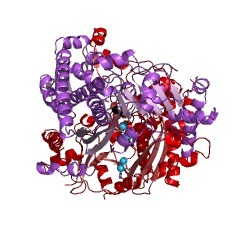 HerA ispredicted to function in a complex with these proteins in DNA pumping andrepair of double-stranded breaks introduced during this process and,possibly, also during DNA replication. Extensive comparative analysis ofthe 'genomic context' combined with in-depth sequence analysis led to theprediction of numerous previously unnoticed nucleases of the NurAsuperfamily, including a specific version that is likely to be theendonuclease component of a novel restriction-modification system. Thisanalysis also led to the identification of previously uncharacterizednucleases, such as a novel predicted nuclease of the Sir2-type Rossmannfold, and phosphatases of the HAD superfamily that are likely to functionas partners of the FtsK-HerA superfamily ATPases. NurA, a novel 5'-3' nuclease gene linked to rad50 and mre11 homologs ofthermophilic Archaea. We isolated and characterized a new nuclease (NurA) exhibiting bothsingle-stranded endonuclease activity and 5'-3' exonuclease activity onsingle-stranded and double-stranded DNA from the hyperthermophilicarchaeon Sulfolobus acidocaldarius. 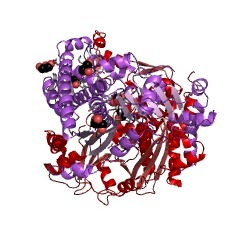 Nuclease homologs are detected in allthermophilic archaea and, in most species, the nurA gene is organized inan operon-like structure with rad50 and mre11 archaeal homologs. Thisnuclease might thus act in concert with Rad50 and Mre11 proteins inarchaeal recombination/repair. To our knowledge, this is the first reportof a 5'-3' nuclease potentially associated with Rad50 and Mre11-likeproteins that may lead to the processing of double-stranded breaks in 3'single-stranded tails.